Tereza, where are you from originally and how long have you been in Denver? I grew up in Prague, Czech Republic and have lived in the US for the past seven years (six in Denver). What made you decide to become an English teacher? The never-ending challenge of the field (it really keeps your brain active!) and the opportunity to meet people from all around the world and learn from them. Tell us a bit about background. I have degrees in social linguistics and political science and I am very lucky to be able to utilize my knowledge in both fields. Besides being an English as a Second Language (ESL) teacher with experience from my home country and the U.S., I have also been working as an election expert, monitoring election processes in countries all around the world (Liberia, Zambia, and Belarus, to name a few). Where are most of your students at Bridge from, and what levels do you teach? There are Japanese, South Americans, and students from various European countries in my classes. I teach a mixture of levels, from beginners to Business English students. How would you sum up your personal teaching philosophy? What tips do you have for beginner students who may be intimidated about learning English? What can students do outside of class to improve their language skills? Anything that makes them practice what they learned in their classes. Don’t just sit in a pub! Go out, be active (hike with others, Frisbee in a park, etc. ), explore (museums, theater, concerts), and always teach others about your culture, because it makes you speak even more. What is the biggest obstacle for most people to learning English, and how can they overcome that? Wrong pronunciation can sometimes completely overshadow a relatively high knowledge of English. Active listening is crucial! Asking native speakers to correct your pronunciation is extremely helpful as well. A fear of speaking is another obstacle, but just think about all those intriguing conversations you can have with so many interesting people around you. What do you like best about teaching English as a second language? The fact that I have to regularly educate myself. It’s not a stagnant field, rather an organic one. Every student is different, and sometimes he or she needs a specific approach that I can provide only if I am willing to progress and learn myself. I also deeply appreciate a sense of humor. It is one of the few things in the world without cultural boundaries. Traveling never disappoints me. Neither does a good book or good music (vinyl with its pristine sound is unbeatable). I also enjoy exploring new food places and hiking trails. And right now I cannot wait for fall and winter, my two favorite seasons. 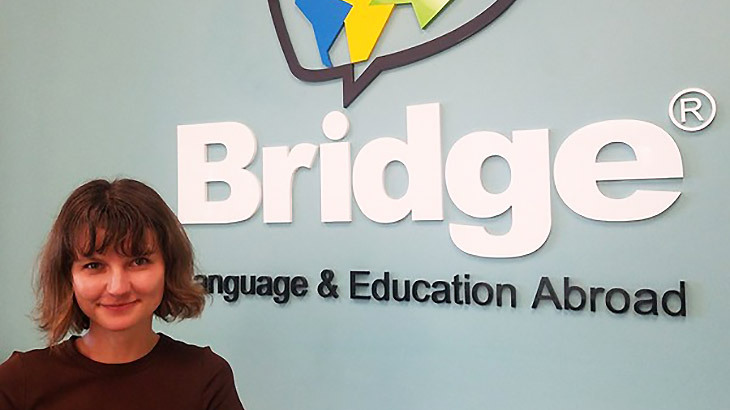 Would you like to take English classes with Tereza or one of our other teachers at BridgeEnglish in Denver? Read more about your options in this article: Find the Program That’s Right for You!